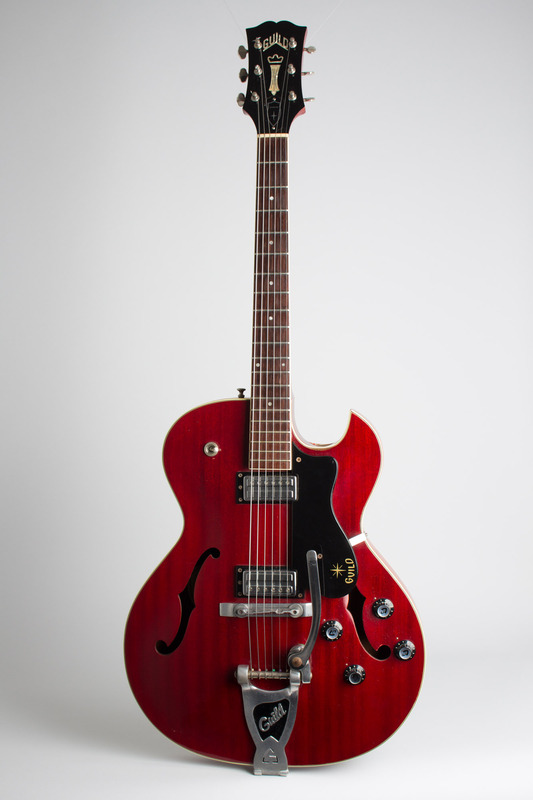 Guild Starfire III Model Thinline Hollow Body Electric Guitar (1963), made in Hoboken, NJ, serial # 28831, cherry lacquer finish, Laminated mahogany body, mahogany neck, rosewood fingerboard, original black tolex hard shell case. 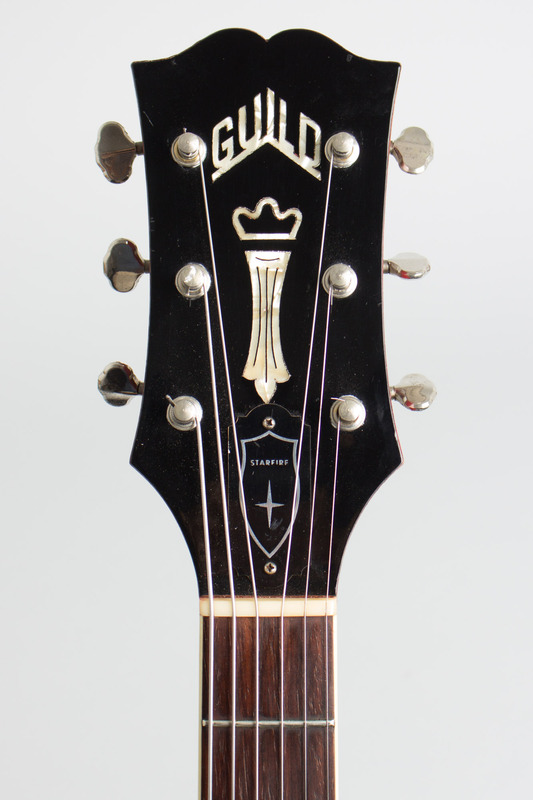 This is a very fine example of a late 1963 single cutaway Guild Starfire III, a guitar that proved to be one of the company's 1960s mainstays. 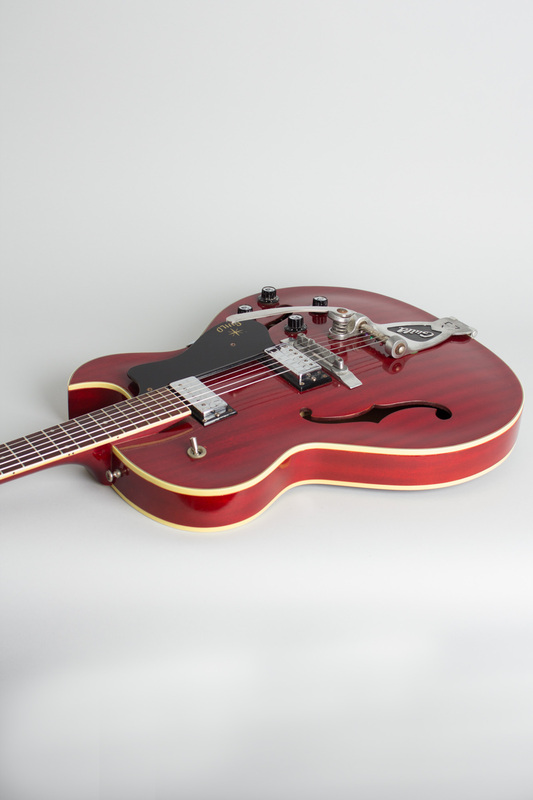 The Starfire III is a fully hollow thinline 16" guitar with a deep cherry finish, with the body triple-bound on the top only and a bound dot inlay fingerboard. This model was easily Guild's most popular electric guitar at the time, and really helped put the company on the map in the early 1960's. 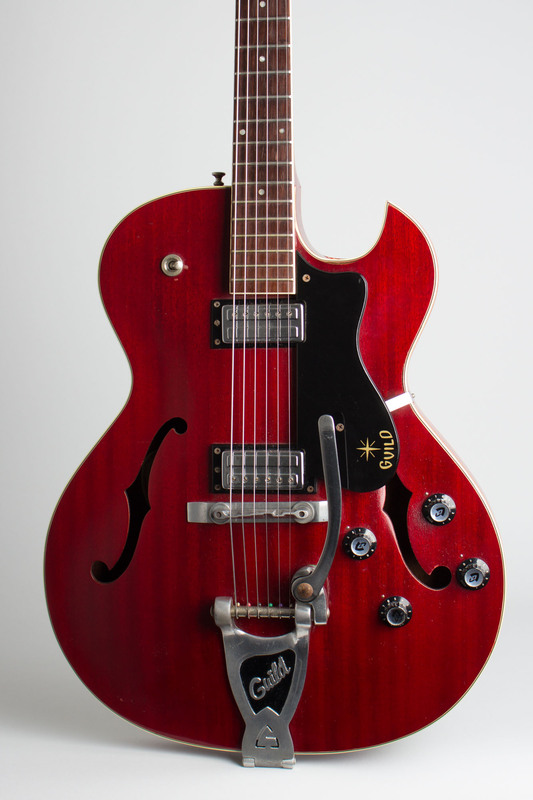 The fittings include a Guild-logo Bigsby tailpiece and bridge-the defining feature of the III model- and ta pair of the then-new Guild Humbucking pickups. 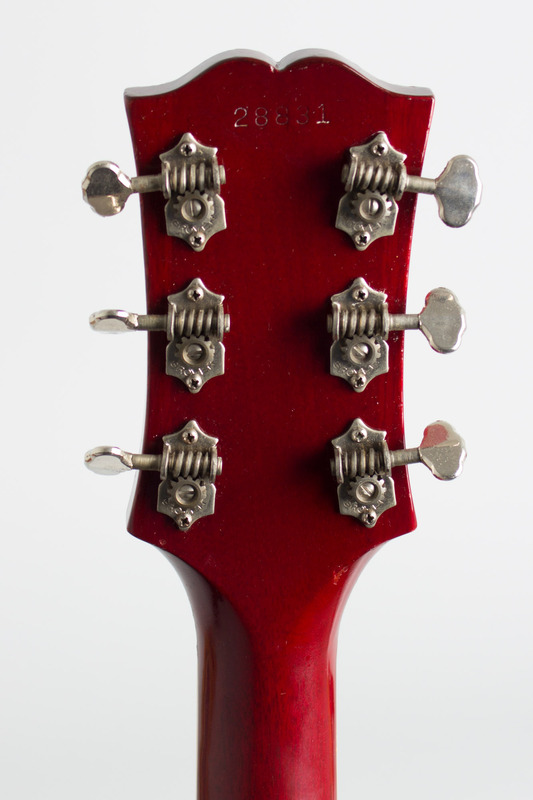 These replaced the original single-coil DeArmonds on this model not long before this example was built. 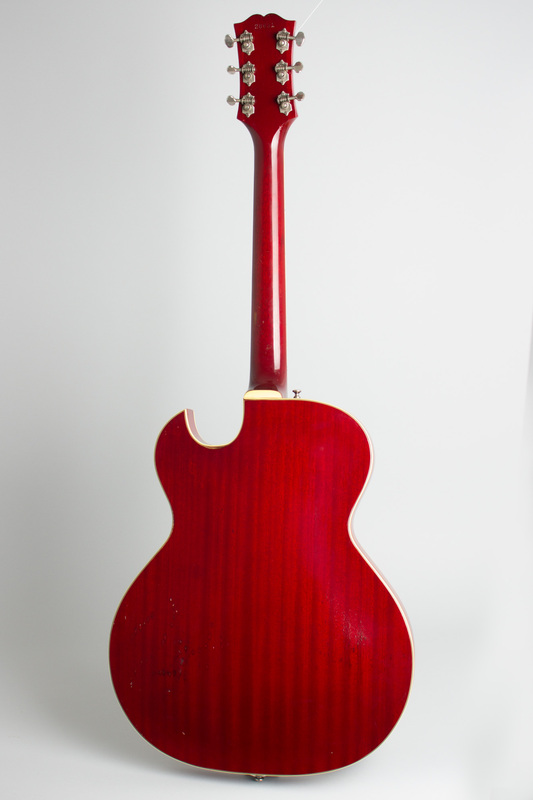 This guitar otherwise has a set of older style features including the original "open book" headstock shape, round-edge pickguard, unbound back body edge and Grover Sta-Tite tuners. The Starfire III is a great '60s rock and roll guitar from the height of the "Beat Boom" era, and one of the few remaining comparatively affordable original classic American guitars of the period. This particular model was extensively used by many mid-1960s groups including the Kinks, Beau Brummels, Music Machine, Dakotas, and many more, and was Guild's defining professional grade electric guitar. The sound ranges from a jazzy purr to the Kinks-ian snarl, with plenty of options in between. This one is set up with flatwound strings, '60's style for the authentic experience! Overall length is 40 11/16 in. (103.3 cm. ), 16 1/4 in. (41.3 cm.) wide at lower bout, and 1 7/8 in. (4.8 cm.) in depth at side, taken at the end block. Scale length is 24 3/4 in. (629 mm.). Width of nut is 1 11/16 in. (43 mm.). This is a super clean and original guitar, with no alterations and just some minimal wear overall. 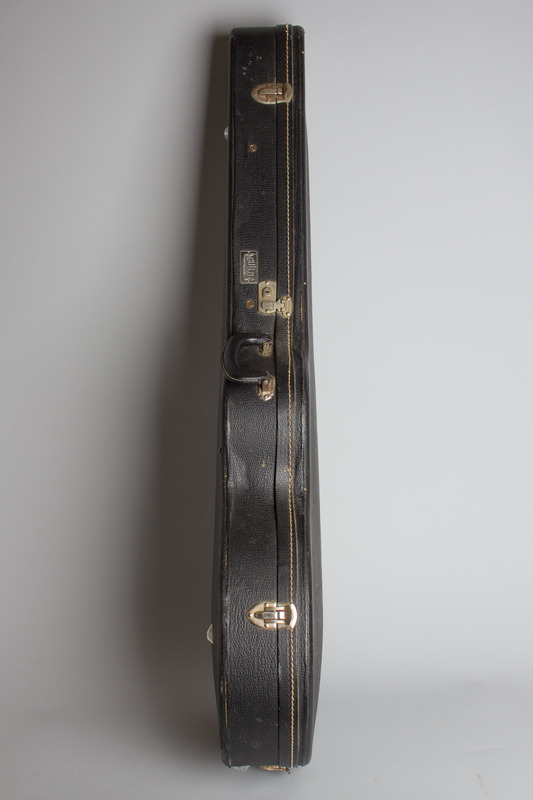 The most notable spot is on the back of the neck, where there is an area rubbed down to the wood behind the 9th fret from contact with a neck rest. 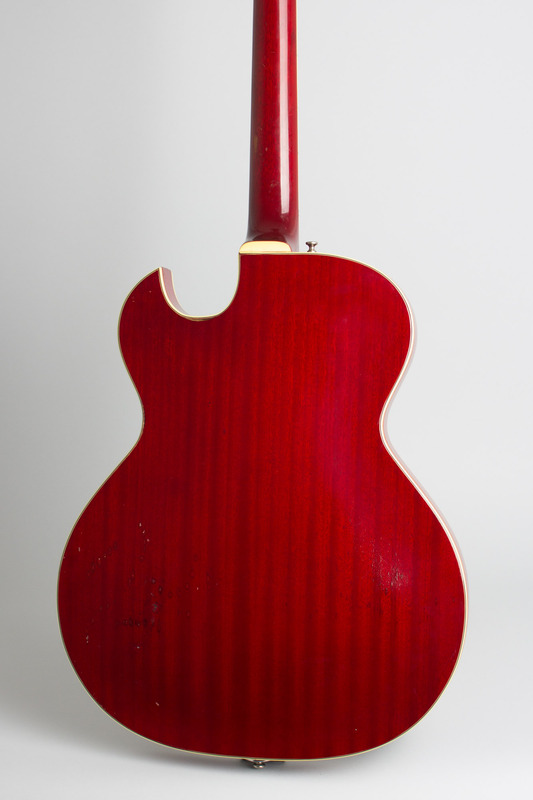 The binding in the cutaway has shrunk up a bit on both top and back and there is a spot of "strap burn" on the back, otherwise the finish is extremely nice with a lovely unfaded deep red color. One of the nicest Starfire III's we have had in a while, complete in its Original HSC. Excellent Condition.